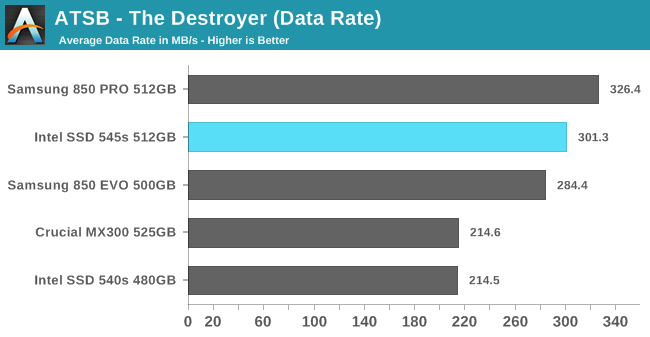 The Intel SSD 545s performs surprisingly well on The Destroyer, with an average data rate that surpasses the Samsung 850 EVO and potentially makes the 545s the new fastest SATA SSD with 3D NAND. The 3D MLC-based Samsung 850 PRO is still out of reach, but the 545s is a big improvement over the 540s and the Crucial MX300. 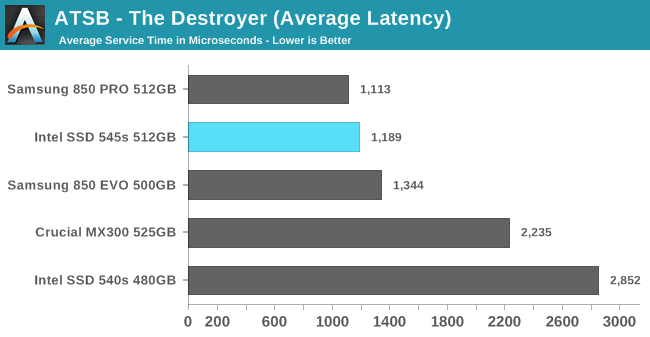 The Intel 545s also ranks between the Samsung 850 PRO and 850 EVO in terms of average latency, with slightly more than half the latency of the Crucial MX300 and an even wider margin over the Intel 540s. Separating the latency according to reads and writes, we see that the 545s is much closer to the Samsung 850 PRO than the 850 EVO for reads. 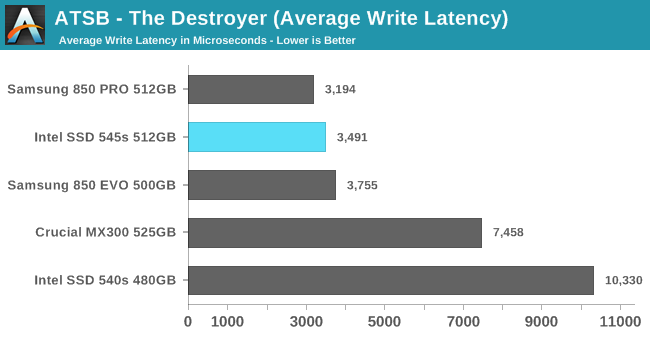 The write latencies of the Samsung drives and the 545s are all much lower than the Crucial MX300 or Intel 540s. In addition to delivering great performance for a SATA TLC SSD, the Intel 545s brings a huge improvement in power efficiency. The 545s uses 12% less energy than the Crucial MX300 or Samsung 850 EVO over the course of the test. 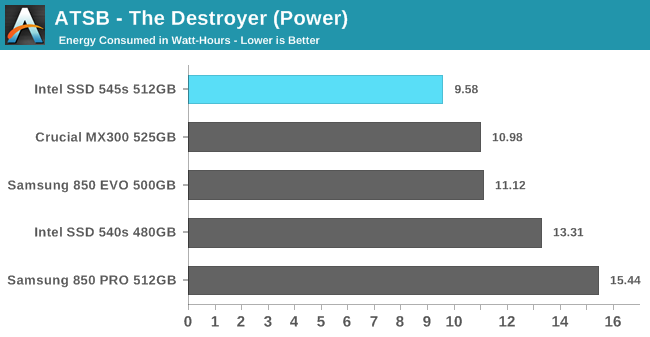 Only a few SSDs have ever completed The Destroyer on such a small energy budget, and only one other TLC SSD has been this efficient. 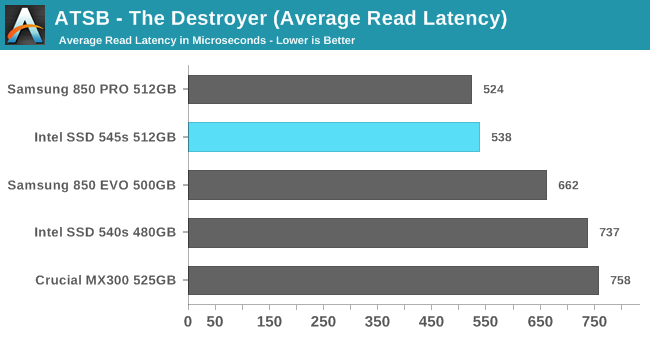 "On some tests, the Intel 545s appears to be the first serious challenger to the Samsung 850 EVO's combination of high performance and good power efficiency in a TLC SATA SSD." Oh Intel, how far have you fallen. You used to be the innovator, the forerunner. Now you're playing catch up and barely managing at that.